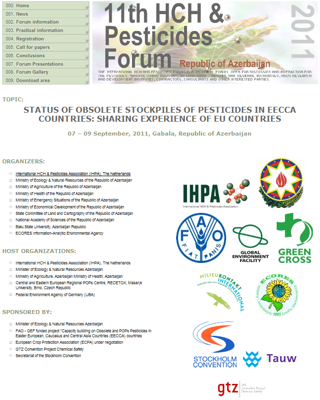 We have the pleasure to announce the 11th International HCH and Pesticides Forum, to be held from 07 – 09 September, 2011, in Gabala, the beautiful town in the mountains of the Republic of Azerbaijan. During my visit at the end of September and beginning of October, all stakeholders have shown full commitment and strong engagement. Azerbaijani hosts and I are confident that the Forum will be a success, showing the achievements in the field the country has made. The Special Forum website (http://www.hchforum.com) is now under construction, and from 10th of December 2010 you will be able to register. Further all IHPA newsletter readers will be updated on the 2nd announcement and all new developments. So we are waiting for you to join us and move forward in the solution of obsolete and POPs pesticides in September in Azerbaijan. We count on you!